Overview - Toshiro Mifune is unforgettable as Kingo Gondo, a wealthy industrialist whose family becomes the target of a cold-blooded kidnapper in Akira Kurosawa’s highly influential High and Low (Tengoku to jigoku). Adapting Ed McBain’s detective novel King’s Ransom, Kurosawa moves effortlessly from compelling race-against-time thriller to exacting social commentary, creating a penetrating portrait of contemporary Japanese society. Criterion is proud to present High and Low in an all-new high-definition digital transfer. Theatrical trailers from Japan and the U.S.
Human beings often covet what they can't have, looking up from far below with eyes full of envy, and those that live in luxury and ease, those that seemingly have everything, often crave more, losing sight of what was truly important to begin with. Along with all of our wonderful, admirable qualities, this unfortunate aspect of jealously and greed permeates our very being, and it is this dark and unsavory characteristic that fuels most of our violent inclinations. You have more than I do, and that is unfair, therefore, I must take it from you. It is a flawed and dangerous logic as old as time. For some, it is simply impossible to fathom that another could have it worse than they, and it is simultaneously impossible to accept that others are allowed to have it better. For some the grass is, and always will be, greener on the other side, and more is never quite enough. These are merely some of the age old themes and ideas that gently rattle in the tightly structured bones of Akira Kurosawa's thrilling procedural masterpiece, 'High and Low.' An artistically potent fusion of suspenseful chamber piece and sprawling detective story, the film balances two distinct stylistic forms in an effortless and organic dichotomy of kindness and gluttony, love and hatred, and like its original Japanese title expressed, heaven and hell. Loosely based on the novel 'King's Ransom,' the story follows a wealthy Japanese business man, Gondo (Toshirô Mifune), who makes a risky play to purchase a controlling interest in the shoe company he works for. Right in the midst of this all or nothing tactic, he receives a phone call from a ruthless kidnapper (Tsutomu Yamazaki) who claims to have taken Gondo's young son. Struck with panic and grief, Gondo is immediately willing to pay the hefty ransom that will certainly ruin him financially and destroy any hopes of succeeding in his power play, that is, until he learns that the criminal has made a terrible mistake, and has instead captured Gondo's chauffeur's child. Unfortunately, the kidnapper refuses to relent, and what follows is a fascinating and tense morality play, as we watch and wonder if Gondo will sacrifice everything for the safety of someone else's child. From here, the film eventually transitions into a more traditional police procedural, that focuses on a group of detectives as they track down the vile criminal. The script is rich with deep thematic subtext and ideas. Kurosawa uses the story to ruminate on universal themes of sacrifice and greed, while also examining the specific class structure of contemporary Japanese society. Gondo's character is complicated and multi-dimensional, and watching Mifune in the role is like watching a master at work. We see the character struggle with his internal duality, as he tries to reconcile a kind soul with a more blood thirsty desire for success. When Gondo finally makes his ultimate decision, the on screen moment plays like a matter of fact epiphany, as if suddenly without hesitation or question, the character and the audience, realize that there was never really any doubt at all, and despite his apparent quandary, Gondo's choice was really made the second the crisis struck. It is simply in his nature to do as he does, and his decision rests at the heart of the film's powerful message. Throughout the film, particularly in its first hour, Kurosawa demonstrates an absolute mastery of composition, blocking, and infrequent, but deliberate camera movement. The first half of the movie plays out like a self contained stage play, keeping the action firmly in Gondo's home as he and the police bargain with the kidnapper and decide what to do. The director shoots these sequences in a series of long, uninterrupted takes, eschewing coverage for a more artistic and economical approach. The often stationary, almost fly on the wall angles, place us right in the action, and the unbroken, extended takes further the illusion of real time. Composition and blocking become an intricate exercise in thematic juxtaposition, as characters are specifically placed all around the film frame in deliberate relation to one another, using physical space to heighten the impact of emotional space. As Gondo wrestles with his moral dilemma, the actual father of the kidnapped child constantly lingers in the background or edge of many shots, acting as an ever-present reminder and symbol of guilt and conscience. The way the actors actually stand in these early sequences, becomes an art form unto itself, with characters positioned like mournful tableaux vivants, perpetually cast in down titled, pensive stares. The various layers of the film frame are also utilized to their full effect, with characters and activity not only inhabiting the left, right, and middle of the widescreen frame, but also the foreground, middle ground, and background, creating a complex and deep visual experience. By keeping the entire shot in focus, the audience is able to actively scan the frame, picking and choosing which little detail to focus on. Occasional, simple pans, tilts, or cuts will come into play, gently nudging the emphasis toward particular characters and actions. By using multiple cameras on set, unlike most traditional films, these cuts don't actually break the apparent air of real time, and instead continue to reinforce the tense, continuous tone. The second half of the movie takes on a rather different visual approach, leaving the self contained style of the early sequences for a more broad and encompassing canvas. The detectives take to the streets of Japan, using various clues to track down the elusive kidnapper. The entire scope of the film is opened up now, and the focus of the movie shifts away from Gondo to the actual procedural tasks, creating an exciting look into the detailed minutia of police work. Each member of the team and each clue they come across, becomes an important cog in a greater machine, all working diligently to catch the criminal. Kurosawa uses more camera movements and cuts, especially in the film's thrilling climax. 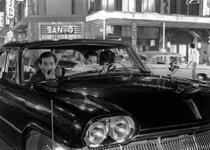 The early parts of the movie are also fairly free of music, but in these last scenes, score is used to heighten the tension as the police follow the kidnapper into a noisy club. The scene in which they eventually make their move on the criminal, is brilliantly juxtaposed against an instrumental version of "O Sole Mio." While this stylistic shift sounds like it might be jarring, it works organically with the evolving narrative and fits the tone of the scenes perfectly. Though the movie loses a bit of gravitas when Mifune ceases to be an active protagonist, the second half storyline is still strong and worthy of what comes before. Envy leads us to many things, from anger, to violence, to madness. Conversely though, compassion often leads to only one result, and 'High and Low' shows us the consequences of acting upon both conflicting impulses. In Kurosawa's world, greed fittingly begets eventual destruction, but not without complications, and kindness begets many hardships, but also, much more importantly, kindness begets kindness. The movie's chilling climax is a startling, conclusive, yet still ambiguous treatise on the highs and lows of life and society, and their great and far reaching effects on the human soul. Kurosawa's tense thriller is a masterful work of moviemaking, deeply entrenched in meaningful images and themes. Basically, this is essential cinema. 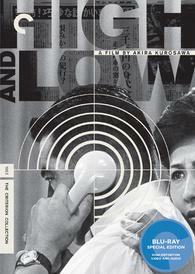 Criterion presents 'High and Low' on a BD-50 disc housed in their standard, clear case with spine number 24. A booklet is also included in the package with an essay by critic Geoffrey O'Brien and an on-set account written by film scholar Donald Richie. The movie is provided with a black and white 1080p/AVC transfer in the 2.35:1 aspect ratio. Despite some small issues, this is an absolutely stellar transfer. The print is in very good shape, with only some minor speckles, vertical lines, and scratches visible from time to time. A light to moderate layer of rich, natural grain permeates the image with a lovely textured quality. Detail can be fantastic, showing off the amazing compositions with wonderful clarity. A few shots do have a slightly blurry look, which appears to be the result of restoration techniques, and some sequences may have some minor artificial sharpening, but for the most part, the transfer looks great. The intricate blocking, using the various layers of the frame, from foreground to background, shines through remarkably well, and despite the use of telephoto lenses which tend to flatten images, there is an often palpable sense of depth. Black levels are mostly deep and inky, but can appear slightly elevated in a few isolated scenes. The only minor area of contention comes in the transfer's blazing white levels. Whites can appear extremely intense, and while this leads to a pleasing pop, it can make the image seem a bit blown out and possibly artificially boosted. Still, this may simply be a result of the lighting techniques used in filming, and doesn't really hurt the presentation. 'High and Low' looks stunning on Blu-ray, and though there are some minor signs of digital enhancement, for the most part, this looks like a natural and authentic presentation. The movie is presented with a Japanese DTS-HD Master Audio 4.0 track with optional English subtitles. Though not a full blown 5.1 mix, the sound still holds its own nicely. Dialogue is clear and rich, lacking that thin quality that many films of this age have. Directionality across the front soundstage is handled well, though the first half of the film is rather quiet and center speaker heavy. Rears aren't always active, but do come into play during specific sequences, adding a very pleasing and full level of immersion. The climax of the film, which sees the police trail the kidnaper through the streets of Japan and into a nightclub, is the liveliest, and here the track displays some great surround usage. Dynamic range is strong and while not as deep as modern mixes, bass activity does have some kick in certain scenes, particularly the aforementioned climax and an earlier train sequence. Balance between all the elements is good, with no effects overpowering dialogue. This 4.0 track was a pleasant surprise for a film of this age, and 'High and Low' sounds very good, showcasing some artistic sound design choices with pleasing fidelity. Criterion has put together a nice collection of supplements, including a commentary, a documentary, and some interviews. All of the extras are presented in 1080i in Japanese Dolby Digital 1.0 with English subtitles, unless noted otherwise. Commentary by Stephen Prince - Akira Kurosawa scholar, Stephen Prince, is the sole participant in this track. Prince provides a very academic but interesting discussion. He gives some background historical information and focuses the majority of the track on a detailed analysis of Kurosawa's stylistic choices, compositions, and camera movements. Some major differences between the film and its source material are also discussed. Though Prince seems to be reading from prepared remarks, his analysis of the filmmaking and themes is interesting, making this a worthy listen for fans of the movie. Akira Kurosawa: It Is Wonderful To Create (HD, 37 min) - Presented in Japanese Dolby Digital 2.0, this is a very informative look back at the making of the film. Interviews with the cast and crew are included, along with behind-the-scenes stills from the production. An in depth breakdown of how certain scenes were shot is provided, with lots of details on the director's use of multiple cameras for long extended takes. A lot of the participant's comment on how intense and stressful it was on set, as no one involved wanted to be responsible for blowing one of the complicated long takes. Fans will definitely want to check this out. Toshirô Mifune (HD, 31 min) - Taken from a 1984 Japanese talk show, this is a rare and comprehensive interview with actor Toshirô Mifune. The actor discusses his then recent projects, and the path that led him from the army to acting. Of some mild amusement are the female host's exaggerated reactions to some of Mifune's comments, particularly when he mentions the large budget of one his films. Though there is some standard talk show fluff here, the interview is mostly interesting and it's great to see the legendary actor laid back and open for discussion. Tsutomu Yamazaki (HD, 19 min) - This is a 2008 interview with actor Tsutomu Yamazaki. He discusses the audition process for the film, and gives various details about working with Kurosawa and Mifune, as well as insights into shooting the famous, intense final scene. Trailers (HD) - The film's Japanese theatrical trailer (which oddly starts off with the actual ending of the movie), Japanese teaser trailer, and American theatrical trailer are included. 'High and Low' examines the pitfalls of jealousy and the hardships of compassion. For many, there is a constant, internal struggle between both paths, but for some, it becomes clear that there has only ever been one road. Kurosawa displays a masterful command of images and plot, leading to a true classic of cinema. The video quality is fantastic, and the audio is strong. Supplements offer a nice look at the making of the film, and are well worth your time. This is a great disc for an amazing movie. Highly recommended.